Last week I guest posted homemade peppermint patties over at My Invisible Crown and today Christy is guest posting over here. As I said last week, Christy and I quickly became friends bonding over many things, one of which was Alabama football :). 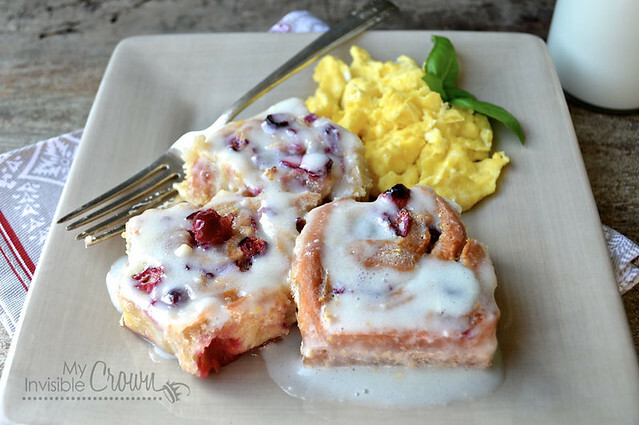 Today she is sharing cranberry orange sweet rolls that look absolutely fantastic. If you remember my cranberry-lemon squares, you’ll remember my love of all things cranberry--so these are right up my alley! These would be wonderful to have for breakfast on Christmas morning. Like Christy, I was somewhat nervous to use yeast for the first time but I promise it is not as intimidating as it seems! Hi! I'm Christy from My Invisible Crown and I'm guest posting today for my sweet friend Heather. I'm semi-new to the blogging world and Heather was one of the first people I met when I started...I couldn't be happier. We haven't met yet in person, but I know we'll be life long friends. And we do actually have plans to meet soon when she comes to Alabama next! I'm also from Alabama (I guess that was obvious?). I live here with my husband who's from New Orleans and three kids. My blog is mostly about food...I love it so! But you'll occasionally find the random fashion piece or decorating post. Pop over when you get a chance and visit with me a bit? 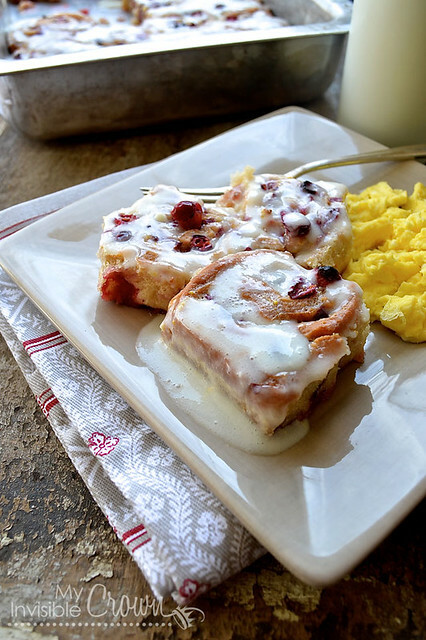 I'm sharing today Yeasted Cranberry Orange Sweet Rolls for a couple of reasons. On My Invisible Crown I'm almost obsessed with festive, holiday foods and also because what's better than cranberry and orange together? I made these cranberry orange almond cookies and knew they'd be perfect in a warm, sweet, yeasty roll. Yum! Cranberries start showing up in the grocery stores in early November and go away after the holiday season. For that reason I stock up. Every time I go to the store, I buy 2 or 3 bags and stick them in my freezer and I have them all year long. I even use them in my holiday decorating. You can see some examples here. They freeze better than any other fruit and I never know the difference. I grab a bag from the freezer, throw them in my food processor and beat them up a little before putting them in this recipe so there are some whole pieces and then some bits, too. 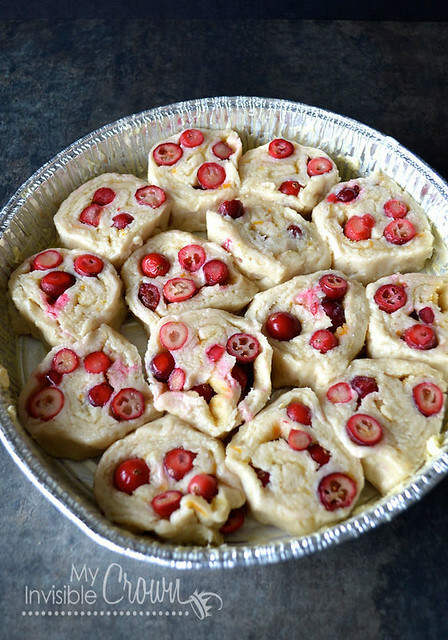 This is a double recipe so you can make these cranberry orange rolls and then another variety of your choice. They're wonderful as blueberry lemon or cinnamon or even a dinner roll since the base dough isn't sweet yet. Take your pick. I was always intimidated by yeasted breads for some reason. If you're like me, don't worry. This is really an easy recipe. You mix a few ingredients together, cover the bowl and let it rise for an hour, add flour and combine and divide. Putting half in your fridge for another use and rolling out the other half to make your rolls. Top with lots of butter, this fun orange perfumed sugar and the cranberries and roll them up! Slice and bake! One thing though. You're supposed to let them sit on the counter for about 20 minutes once they're in the pan so they rise a little more. I forgot with these so they aren't as sky high as I like. They taste amazing but don't forget that last step! Also another tip, if you don't already use aluminum free baking powder, you should get some. The aluminum can contribute to a "tinny" taste and it also will throw off the color in things with red or especially blue fruits and we can't have that! When halving your dough you get about a 9x13 size pan plus about another small 9 inch cake pan full. You can use any size dimensions you like. This is just what I had. The printable version is below. Turn on your oven on a warming cycle or as low as it will go for about 5-10 minutes. You want it just slightly warm inside. Turn off heat. In a heavy pot mix whole milk, 1 cup of sugar and oil over medium heat until bubbles begin to form on the edges. Sprinkle yeast over the top and let it sit for two minutes. Add in 8 cups of flour and gently stir until combined. Cover with a dish towel and put inside your barely warm oven for 1 hour allowing your very sticky dough to rise. Add additional cup of flour, salt, baking powder and baking soda and stir to combine. Half the dough, cover and refrigerate both portions. Preheat your oven to 375 and butter your baking dishes. 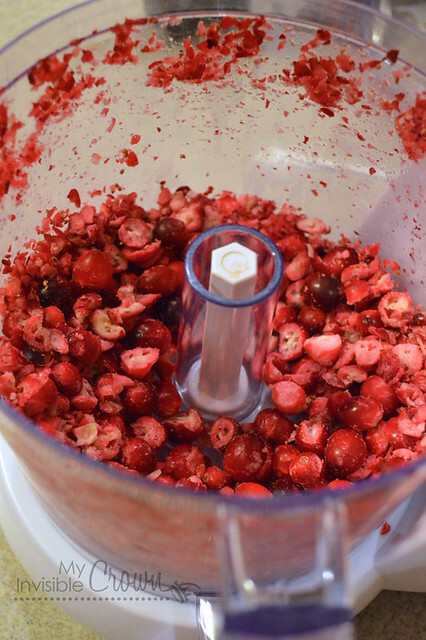 Place half your whole cranberries in a food processor and pulse several times until they are broken into pieces but not minced. You want large chunks. Melt 1 stick of butter and set aside. Pour the melted butter on top and rub to the edges with your fingers. Follow with the orange scented sugar, making sure all areas are covered well. 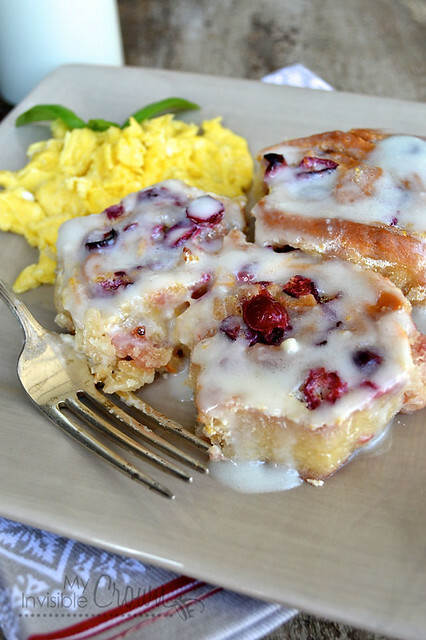 Top with cranberries. Make sure they're distributed evenly. Beginning at the side furthest away from you and making sure there's a line of cranberries along that edge (this becomes the inside so you want cranberries all the way in the middle) begin rolling. Starting at one end and going to the other and back rolling towards yourself until the whole thing is rolled into a long, tight log in front of you. Pinch the edges to make a seal and any holes that might have opened. Starting at one end, slice 1/2 inch thick sections and lay the slices, cut side down in your buttered baking dish. Allow to sit and rise for 20 minutes. Place in your 375 degree oven and bake for approximately 20 minutes or until golden brown. It's important to make sure they're a good golden brown to insure the insides and bottom are cooked through. Remove from the oven and allow to cool. They should be slightly warm when you begin to glaze so that the glaze reaches all the nooks and crannies but that they're not so hot that the glaze melts. Add your orange juice, remaining zest from 1 orange, half and half, cream cheese, powdered sugar and dash of salt and whisk together well. Taste and adjust if needed. You want it to be sweet and fairly thick. What's your favorite flavor combination? Any good suggestions? If you get a chance to make them, please stop by and let us know! Thank you so much Heather for letting me guest post for your readers and thanks to all of you for spending a little part of your day with us! Have a happy holiday!